August | 2017 | Ellsworth AFB Volunteers! The annual Once Upon a Festival will be held 9-10 Sep 17. 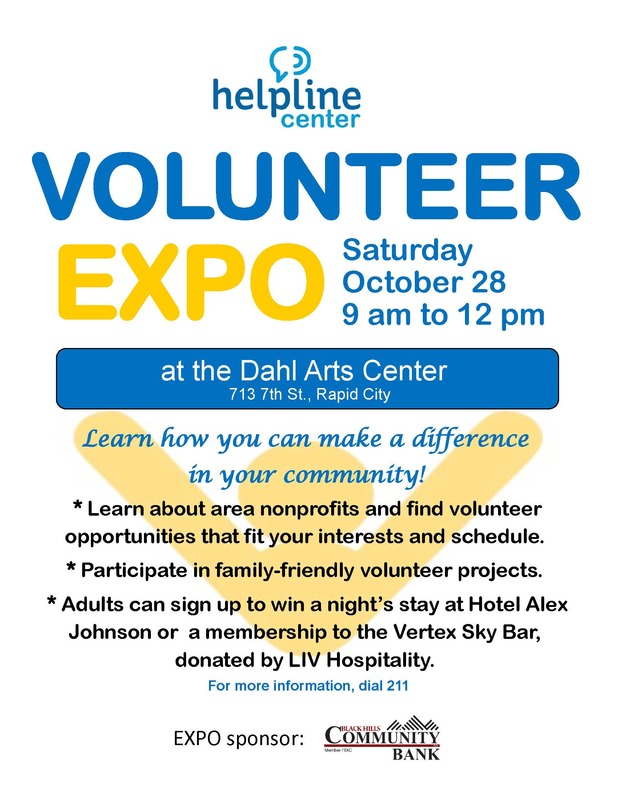 They are looking for volunteers for this 2-day event, which runs 9:30AM to 5:30PM. 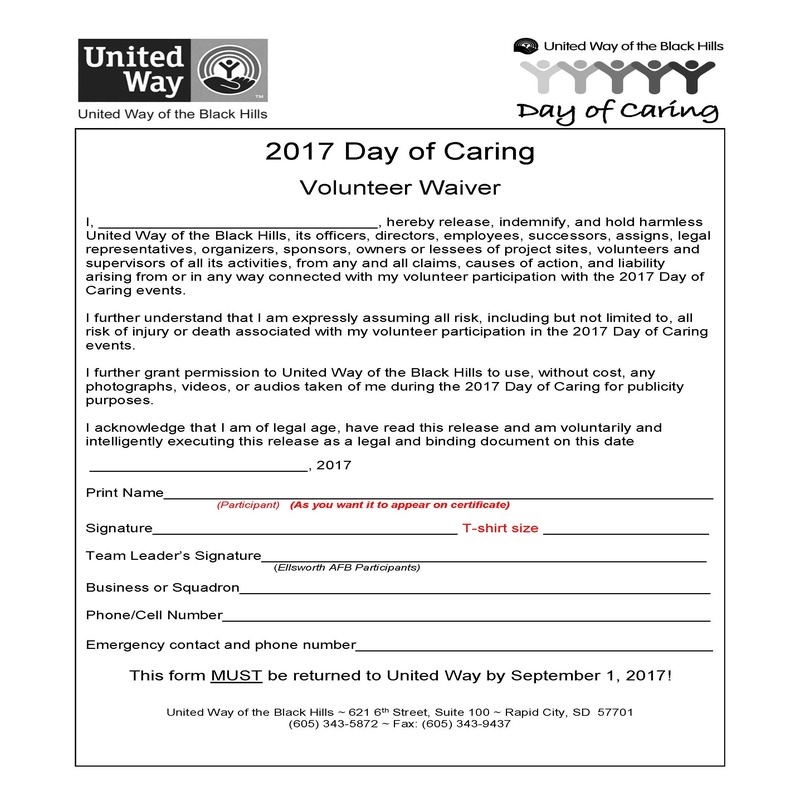 You can volunteer for a half day or the whole day. The volunteers will be asked to assist with running the games. For more information, call 605-342-6357. The Alzheimer’s Association seeks volunteers for the Rapid City Walk to End Alzheimer’s on Saturday, Sept. 23. Set-up volunteers are needed between 6 a.m. and 8 a.m.. These volunteers will help with set up and decorate the walk route, registration area and the stage. Registration volunteers are needed 8:30 a.m. to 10 a.m. These volunteers will work check in pre-registered participants and day-of registrants. These volunteers will also provide T-shirts when applicable. Greeters are needed 8:30 a.m. to 10 a.m.. Volunteers will help participants fill out registration forms and direct them to the appropriate line. Promise Garden volunteers are needed from 8:30 a.m. to 10 a.m. These volunteers work in the promise garden tent handing out appropriate flowers. Tear down volunteers are needed from 10 a.m. to 12 p.m. They will help take down the route and clean up the registration area. Water stop volunteers will work from 9 a.m. to 11 a.m. and will provide water to participants. For more information, call 605-339-4543. Sharpen your clerical skills by volunteering! City/County Alcohol & Drug Programs welcomes volunteers to assist with answering phones, greeting visitors and clients, and accomplishing a variety of light clerical work (filing, shredding, making copies). Their administrative offices are open Monday through Friday, 8 a.m. to 5 p.m., and volunteers would assist within that time frame, at the convenience of the volunteer. Computer or multi-line phone experience is helpful but not necessary. They will train. For more information, call (605) 394-6128. 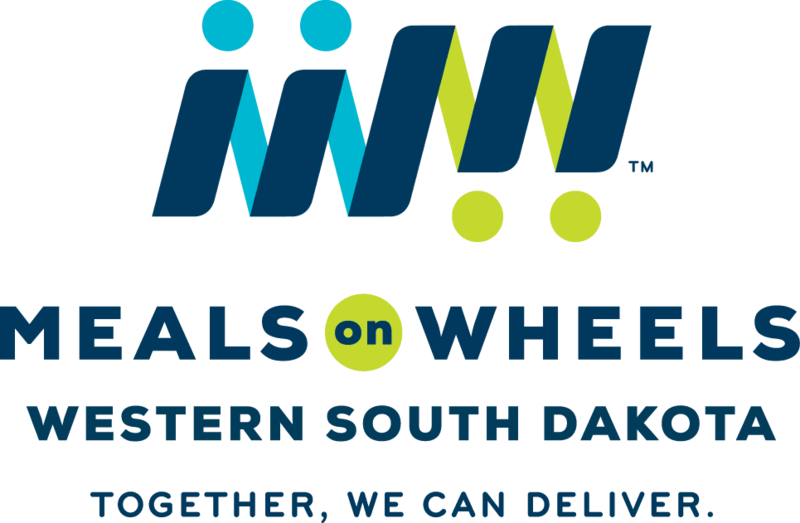 The Meals on Wheels representative for Rapid City has afforded us an opportunity to open more days during the week to deliver meals. For those that have volunteered for this opportunity know that Wednesday was the only dates available. Now, with more dates available it will be more convenient for those who would like to volunteer but can’t get away on Wednesdays. The delivery process will take roughly around 2 hours, so if you choose to volunteer, be aware of the time it will take. Please view the dates available below and email SSgt Palmer (Jamie.palmer@us.af.mil) if you would like to volunteer for any dates listed. Please review the information below for the details: if you can’t make it for any reason, please let SSgt Palmer know ASAP! She need to find someone to take your place. The meals are ready for pick up at 10:45. The sooner you pick up, the faster you get out. The MEALS Program is off Philadelphia/N. 4th Street. Across from the Rushmore Center Civic Center down Haines Ave; behind the boys club. Take New York Street by the Boys Club and turn North on 4th street. It’s the tall White apartment building, around back there is a MOW entrance. You’ll take a red hotbag and red cooler of food – both marked “NE”. There will also be clipboard with instructions and the route with directions to each house. Just follow the list and you’ll be done within an hour. The School-Based Mentor Program is designed to help children reach their potential at school but isn’t limited to the classroom. Littles talk with their Bigs about class, do homework or read together. it’s about starting a friendship, providing guidance and inspiring children to succeed. A training series for new Court Appointed Special Advocates (CASA) volunteers begins October 14, in Rapid City. Seven sessions plus five hours of court observation complete the training. Volunteers train to speak up for the best interests of abused and neglected children in the court system. CASA volunteers help find safe, loving, permanent homes for children. 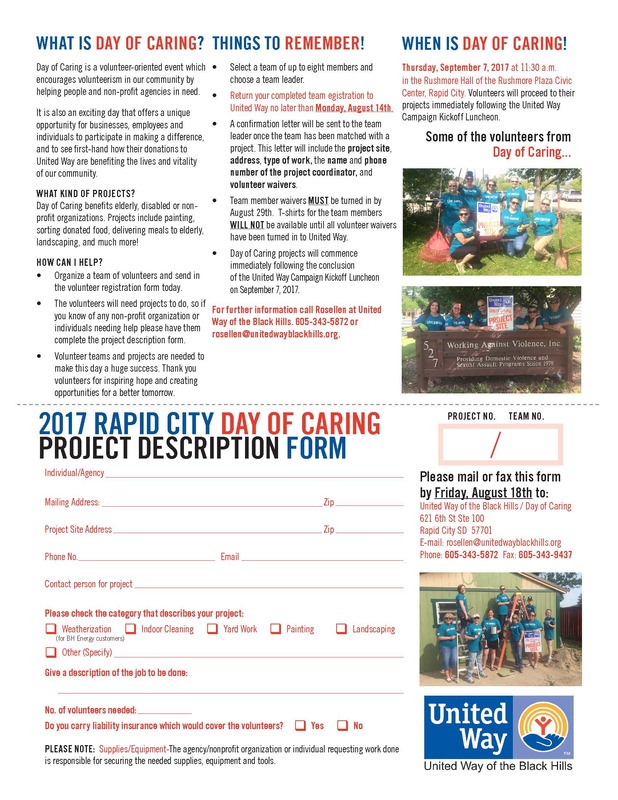 For more information, call 605-394-2203 or go to the website http://www.casaofrapidcity.org. 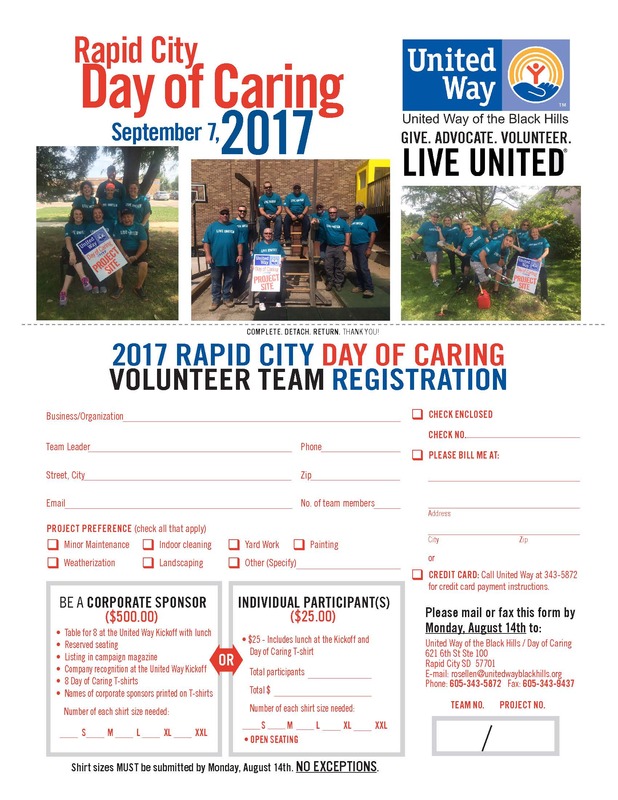 Rapid City’s United Day of Caring will continue to accept volunteer waivers until 1 Sep 17. This is a great way to have fun and show your support for the local community! Feeding South Dakota is seeking volunteer groups to assist with food sorting for the Emergency Food Assistance Program (RC Food Pantry). The schedules are flexible Monday – Friday between the hours of 9 am – 3 pm. Two hour shifts are preferable. Also, they are specifically looking for a group of approximately 15 volunteers on Saturday, August 26 from 1-3 pm to help sort food for the Boy Scouts Food drive. To volunteer please email Shawna Gray at shawna@feedingsouthdakota.org or call 718-9590. Will you help the Mobile Food Pantry? The Mobile Food Pantry, a collaborative between Feeding South Dakota and the General Beadle Community School, seeks five volunteers to help with the Mobile Food Pantry at the General Beadle Community School. Volunteers will help with bagging and distributing food. For more information, call Morgan or Anita at (605) 394-1841.